Professionally trained non-denominational hospital chaplains are available to patients and their families 24/7. The chaplains are available to provide support, counsel, prayer and rituals of faith. If a minister or spiritual leader from a specific faith perspective is desired, a chaplain will locate a representative of that specific faith group for you. To learn more about religious and spiritual services and resources, please contact Pastoral Care at (352) 265-0224. Celebrated Tuesdays through Saturdays at noon. Conducted on Fridays from 1:30 p.m. – 2 p.m. Meets on Tuesdays and Thursdays from 3:30 p.m. to 4:00 p.m. 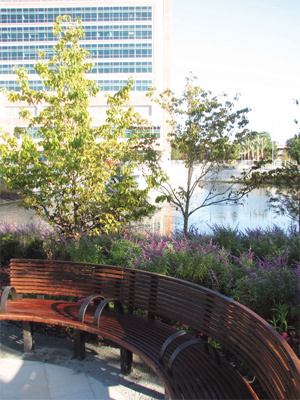 The Garden of Hope with its pond, butterfly garden and walking paths offers a quiet place of beauty to pause and reflect. The garden also features tributes to loved ones living with cancer and those who have defeated cancer. The garden also serves as a place for public events. UF Health Patient and Family Resources Department is here to help you in a variety of ways. Social workers are assigned to specific units and service areas. They provide counseling, problem-solving and financial/insurance information. They also help families get ready to go home. Call extension 5-0224 or 352-265-0224, or tell your nurse you would like to contact a social worker. UF Health offers a pet therapy program where volunteers bring their own dogs into the hospital to visit patients. Participating dogs have been approved by Volunteer Services and are well-behaved, healthy, vaccinated and clean. To request a pet therapy visit, contact Volunteer Services at 352-265-0111 ext. 5-0360. Ask your nurse and roommate permission. Provide vaccination records for your pet. Make sure your dog is bathed. To schedule a personal pet visit or for more information about the program, contact Volunteer Services at 352-265-0111 ext. 5-0360 or ext. 5-0360. The Arts in Medicine Program (AIM) provides art-related activities that help stimulate the imagination. The Artists-in-Residence are available to work with you and your family through music, dance, painting, creative writing and more. For more information, call 352-733-0880.